One thing I like to do , especially with portraits, is to crop tight. 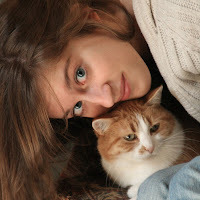 In this portrait the main subject is the cat (it's always the animal, unless of course it's a baby). The cat is right-side up and placed in the bottom right quadrant of thirds. People! Watch that mystical rule of thirds! Many photographers I've seen don't understand the principle of flash lighting outdoors. It's important that the foreground is never unnaturally brighter than the background. This is also true when photographing an indoor scene where there is a window in the background; make sure you don't render the daytime into nighttime by over exposing (with your flash unit) the interior. Make a realistic balance between interior subjects and the light coming in from the outside. When I take my studio on the road, I follow the rule for great photography: great subject, great light and great background. I use only artist painted backgrounds. I like Owens Originals best because of their quality and great price. I like a stormy sky with hints of blue. I also use a "friendly" blue sky for most of my school portraits. My favorite lighting is the Alien Bees mono light. It is light weight and powerful. For the above portrait I used a simple set up with one key light with umbrella placed high, lighting the "mask" of the face; I used a silver reflector, throwing reflected light from the key unto the unlit side of the face; I used a hairlight with an umbrella placed high in back of the subject. BUT what makes this portrait adored by the subject--I used a very expensive Nikon soft filter. A good soft filter will SOFTEN but not BLUR. There are plenty of techniques to blur or render out of focus, but for a successful portrait you need to SOFTEN the image and maintain RAZOR SHARP-FOCUS. Additional comment!!! 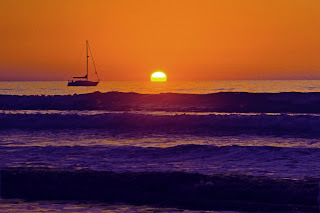 I've noticed a trend (with the popularity of consumer digital cameras and Hi-def TV) for all photos to be razor sharp. 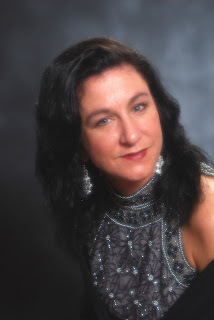 Soft-focus has temporarily taken a back seat to hyper airbrushing using PhotoShop. I've been guilty of this for a long time getting complaints from some customers that I make them look too good! I've discovered a way to create impeccable soft focus effects after the image has been made with the camera, using PhotoShop and NO airbrushing. Here it is in it's simplest form. With Layers, create a duplicate top layer. Blur heavily the top layer using Gaussian Blur in Filters. With both layers open for view, take top layer and make it less opaque using the slider to 15 to 20% or until it looks good to you. This technique puts any expensive filter to shame and comes in very handy for portrait photography. You can maintain a sharp image or soften it as much as you like. The principal is that the bottom layer is always razor sharp, but the top layer (which is transparent) diffuses the image without reducing the bottom image's sharpness. This the same thing that all expensive soft filters have tried to accomplish with limited success. Fractals are interesting. What is a fractal? It is based on a mathematical formula developed to synthesize observable creation--and when fed into a computer produce unlimited and sometimes recognizable landscapes and phenomena of the creation around us. Fractal geometry is widely applied today. Fractal art has unlimited artistic potential. 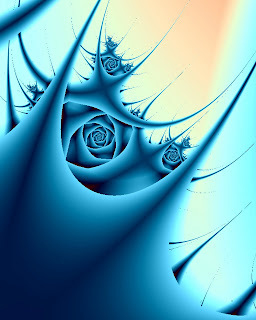 Download a fractal art generator (Tierazon-v29) and see what craziness you can discover. The fractal photo on the right I took reminds me of a blue rose. 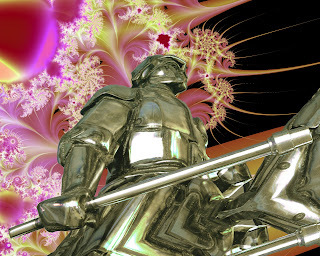 You can combine fractals together with real photos to make interesting psychedelic studies such as my photo Paladin on the left . I took this photo in Albany, NY. Not only was it colorized from it's original b&w but there were also elements added to give it an ethereal sci-fi look. 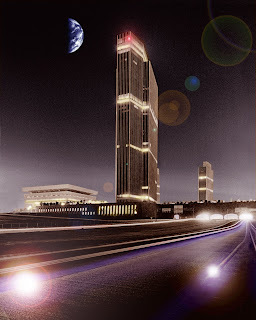 Those elements are lens flare from Photo shop filters, a half earth file borrowed from an on-line source. And mysterious disembodied orbs, following the lines of the auto headlights (traced by a 10 second time exposure in the original negative). Have fun, get out your old negatives and bring them to life again. You can scan old photos by using a flat-bed scanner or if you've got a ton of old negatives you can purchase an inexpensive film scanner. I paid about $250 for a Minolta-Konica film scanner. It works great! 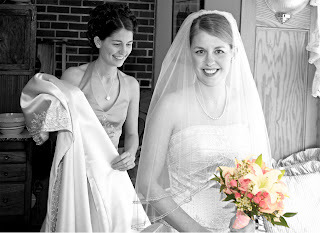 A very popular enhancement, especially for wedding photos, is to spot color elements of the photo. The bouquet is always a favorite but there are many other applications as well. How this is done: select the area of a color image you'd like to retain as colored. Copy the selected area and paste into a new blank file (Photoshop: hit FILE, NEW, BLANK FILE, PASTE). Now under IMAGE, MODE, grayscale the original image to make it b&w. After that, make the image RGB again. It will remain b&w but will now accept color elements. Copy and paste your selected bouquet (very precisely) on top of the b&w bouquet. It makes a charming and very popular photo. One of my favorite things to do with my old black and white negatives is to colorize them by using paintbrush washes in Photoshop. Believe it or not, this photo I took of wine pouring from a bottle is actually a black and white image of water pouring from a colorless clear bottle. 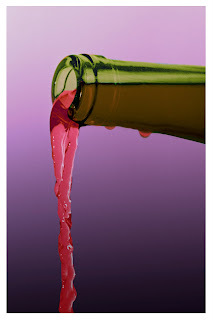 I used layers to create a gradient background, then I considered interesting colors for the wine and the bottle. The wine, I determined would be blood red and the bottle would be a traditional green color. By using the Photoshop brush with varying opacities you get a much better colorized image than you could ever get with those old transparent oil washes from Marshall. With the economy becoming a nightmare and the future becoming uncertain, make your own bright future by learning thrift. There's a certain elegance and art to living a budgeted lifestyle, where eating out and road trips once again becomes a occasional luxury and home cooking and storing deals in the pantry become the norm. You'd be surprised at the quality of life you can live! In planning a wedding these days, simplicity is the key. How about an outdoor wedding at home with home-cooked foods? Or hire a caterer and a band! But watch out if it rains. Pete placed first in class with Nam Vet and Daughter. A study in subtle emotion and race meld. 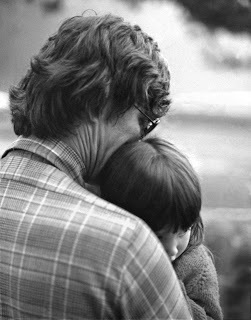 Taken in the late 70s. Lonesome Low--Winner in it's class at Delaware Photographic Society. Photo taken by Pete in Maine. The title was taken from an old ballad-- The Golden Vanity-- to describe a sailor's helplessness against the elements (and politics). This is a study in contrasting colors and light. A new season for wedding photography! Looking forward to the 2009 bookings! Have many availabilities. Give a call 302 636 0868. Great photography great price!